ATLANTA, GA RampedUp, the industry’s leading Account-Based Selling Solution, announced a ground-breaking account scoring feature for their customers. “We are very excited to announce predictive account scoring functionality based on unique capabilities of RampedUp. For years, our customers have been using our Customer Insights for a quick reference library to move deals. Now, we can take the attributes of your most ideal buyers and identify accounts that look just like them” shared Scott Miller, founder of RampedUp. Customers looking for the new functionality can find it in the administrative section of RampedUp or simply work with their service rep to ensure the functionality is accurately represented. About RampedUp: RampedUp is an Account-Based Selling tool used by some of the largest companies in the world. Our mission is to provide contact, customer, and company data all in one place, helping sellers spend less time on administration and more time selling. Learn more at www.rampedup.io. Account Based Selling is the methodology of focusing all of your sales efforts on a select number of accounts because they are the most profitable and likely to buy your products and services. Perhaps you have heard it referenced as a named or targeted account strategy. What is the right number of accounts? According to a report by EverString and Demand Gen Report, 42% of companies surveyed try to keep their account list between 50 and 500. For companies making the switch from a reactive lead generation to a proactive account based selling approach, it can be daunting. Keep in mind – the sheer quantity of leads will dramatically decrease. But, companies with tightly aligned sales and marketing operations teams achieved 24% faster three-year revenue growth and 27% faster three-year profit growth than similar companies who did not. (SiriusDecisions.) Organizational focus is the key, while the “low hanging fruit” might be tempting, the named accounts are far more valuable long-term. A report by TOPO, commissioned by The ABM Leadership Alliance, found that companies that have implemented Account-based principles saw a 171% increase in their Annual Contract Value (ACV). So – how can sellers use this new targeted approach for demand generation? Use the News. Show your targeted accounts that you are in tune with them by referencing news stories or press releases about them. Follow up with those references by linking your solutions to helping with their stated objectives. Go Wide. If you only have a certain number of accounts then increase your contact points with other department heads that may have some benefit to your solution. Account Based selling is more about building a coalition of decision-makers than taking inventory of them. Target. Two ideas that work well for an ABS strategy is to have focused content for a specific company. Vidyard allows for video communication focused on a specific individual. I have seen demos that show functionality geared towards just one person. These videos can be re-purposed as a customized webinar for a company instead of a broad audience. Lastly, there is a new emphasis on effort when if comes to Account-based selling. The opportunistic approach of reacting to inbound leads outside of your sweet-spot doesn’t scale. Sellers need to understand that aligning their expectations with the company’s goals will help both parties long-term. Craig Elias, author of the award-winning sales book “SHiFT! Harness The Trigger Events That TURN PROSPECTS INTO CUSTOMERS,” was sharing his thoughts on selling with the RampedUp team recently. As the first company to create a Triggering Event search engine inside of Salesforce.com, we were excited to hear the father of Trigger Events Selling’s thoughts on the topic. People – New executives are hired to bring in new agendas and are often looking to replace existing relationships in their first 3-6 months. Identifying the executives that are important to your sales process and “helping them unpack” allows you to earn the right to help them set their new agenda. Even better, by following your OC/NC’s (old contact / new company) to their new place of business shortens sales cycles due to the familiarity with your product. Product – New products and services receive the lions-share of a company’s attention to help them get off the ground. They are promoted with press releases and social media posts that are easy to spot. What isn’t easy however is connecting your service to the success of the new product unless you have access to a relevant use-cases. Make the connection simple and effective by providing a reference library for your sellers. Places – When companies expand to new markets they make for great triggering events for sellers. Companies that are moving into new states or countries also have compliance obligations that are non-negotiable. If your service can help with this compliance then you are in a great position. New markets like EMEA or APAC require completely new go-to-market strategies that in-country services can uniquely provide. At RampedUp, we monitor triggering events around products, places, and personnel to help our customers facilitate new opportunities. With 15 fields to narrow down trigger events to a specific company, team, or individual – our salesforce.com integration can help any size business. Lastly, with 180 Million professionals under management, our best customers have global needs. You can try it yourself for 30 days free! Account based selling is a methodology that focuses an organization’s sales efforts on a select number of accounts that are most likely to buy your products and solutions. Organizations can set up an account-based selling strategy in three steps; one – identifying the companies that would be ideal targets, two – identifying the people that work at those accounts, and three – giving those accounts reasons to evaluate your solution. The first step is to identifying ideal prospects is to look in the current customer base by firmagraphic details. Most companies will look for customer accounts by similar size, location, industry, revenue, and tech stack. Stated otherwise, if your best customers are in a specific industry, have a certain number of employees, and deploy a competitive or complimentary technology – then companies that also fit that profile will be your best prospects. The trick to identifying these accounts is by “cleaning” them inside of Salesforce.com. A cleaning will update or complete key fields such as Industry, Revenue, Employee Size, Tech Stack, and Location. After cleaning Salesforce.com, run a report of your current customers including these new fields. With these results, look for the fields that have the largest representation to begin your target account selection process for prospects. The second step is identifying the people that are making decisions at your targeted accounts. While it might seem intuitive, a great exercise is to reverse engineer your sales process to uncover all the stakeholders. These titles and the people that own them should exist inside of Salesforce.com. After all, companies don’t buy anything, people do. If it has been a while since you have “cleaned” your contact records then it would also be a good idea to identify the old records of people that don’t work at your target accounts any longer. B2B data expires at a 2-3% clip per month per Hubspot after all. The third step is to have something to say to your targeted accounts. A good idea is to tell them why they are targeted accounts in the first place and sharing some use cases by similar industries, sizes, or locations. If a piece of their tech stack competes with the technology your company sells, then a quick blurb on the benefits of your differentiation will help. Referencing recent events about the targeted account also helps. These events can be new personnel, new products, awards, corporate expansion, or funding. Companies will promote these events on the news wire or the social media pages like Facebook, LinkedIn, or Twitter. The idea behind referencing events is taking the concept and sharing how you have helped other companies in similar positions. As example, if there is a merger, explaining how you have helped other companies with mergers of duplicate systems and processes. Simply referencing the event and congratulating the stakeholder is not enough. In closing, these three steps can give you the directional path for setting up Account Based selling in your organization. RampedUp can help as well as we have automated much of this inside of Salesforce.com. Prospecting into Targeted Accounts can be challenging. After all, these are the best and most-likely-to-close accounts sellers have in their territory. Many Account-Based Sellers labor over the perfect message to penetrate these accounts only to have an email (that took 3 hours to write) go unread by the recipient. The problem with writing the perfect pitch is that today’s buyers are just too busy and your competition is saying the exact same thing you are saying. But Account-Based selling requires tailored messaging based on the unique aspects of the account that cannot be mass-created. Sellers today see themselves in a no-win situation stuck between these two options. The answers is a perfect blend of traditional multi-touch business development tactics and tailored content that focuses on the account / recipient. There really is no reason to spend more than 3 minutes creating tailored content if you have the 4 C’s of Account-Based Selling at your fingertips. Company – Account detail such as industry, size, revenue, and description of course give some context to the pursuit but understanding why the company is in the news and what technologies they use empowers specific messaging. If the company uses a competitive technology, you can start with a replacement verbiage. If the company is in the news for expansion or growth, you can tie your solutions with their stated initiatives. Contacts – By reverse engineering your own sales process and taking inventory of the titles involved in the training calls, kick-off, signature, approval, and demonstration you can ascertain your buying committee. These titles should of course have people associated with them that work for your targeted account. Start at the top (C-Level) and work your way down (V-Level) looking for sponsorship and referencing the entire buying committee in the process. Customers – Your customers and their success stories are the secret weapon to your campaigns. A recent SAP study found that 90% of buyers want to hear relevant success stories to help them make a decision. When prospecting to targeted accounts reference relevant customers by industry, size, and location. Also, referencing similar titles and their experiences along with products and competitors to quickly raise your credibility. Competition – By understanding your targeted accounts’ largest competitors you truly understand them. All companies are similar in that they are looking for something they can claim as unique. By tailoring your pitch to help drive differentiation and referencing the competition by name, you will be seen as someone who is more of a consultant than a seller. Competitors are also great sources of leads once the targeted account becomes a customer! The 4 C’s of Account-Based selling is the back bone of the RampedUp product. We are sellers and created the RampedUp Battlecard to fit on the account record inside of Salesforce.com. The 4 C’s are pre-populated on every lead, account, and opportunity to help sellers keep their research down to a minimum and optimizing selling activities. RampedUp can empower sellers with critical intelligence that sparks buying decisions. Trigger Events are corporate initiatives (either positive or negative) that generally proceed new purchases. Unlike following a company and waiting for the trigger to occur – RampedUp finds triggers then provides company detail in context to make a sales call. 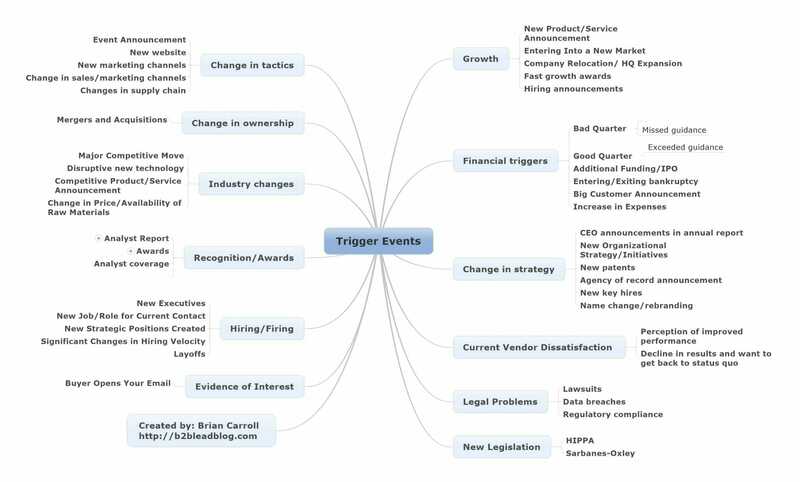 Here are the trigger events we are following and how you can use them to advance a sale process. Partnerships and Joint Ventures – New partnerships require new personnel, process, and software to manage the pursuit. Mergers and Acquisitions – When companies are acquired, it’s a lot like Noah’s ark – there are two of everything. All is put under review to see what is staying and what is going. Corporate Expansion – New markets require new go-to-market strategies including new personnel, facilities, and administration. Products and Services – New products need fresh advertising, branding, and marketing. They also need new channels and sellers. Personnel – New executives come with new agendas and most likely are a 180% different from the predecessor. As an example, a new sales executive will make $1,000,000 in her first 90 days in the office. Legal Issues – Companies that make it into the news for legal reasons want to tell customers and shareholders they have a plan of resolution. Research or Analysis – Companies release independent research to share thought leadership within a certain industry or subject. These are great partner opportunities. Investment and Financing – New money means new funding for initiatives. Venture Capitalists don’t invest their money to watch it sit in the bank. Real Estate – Changing or adding locations is the consummate sign of growth. New employees and new office space means new investments. Awards – Companies want to show leadership that transcends profit and loss. These are often pet projects for key executives. Events – Events are the perfect opportunity to see your prospects in person or help drive attendance to a user conference. Earnings, Performance, Dividends – Public companies are beholden to stockholders and poor earnings often means changes are on the horizon. Savvy Sellers combine Trigger Event Selling with Account-Based Selling by looking for these potential selling activities within their targeted accounts. I wrote this blog on how to use trigger events for Account-based prospecting to help get your foot in the door. A recent study regarding sales efficiency found that sellers spend 27% of their time on completely non-sales related activities. Examples of those activities include looking up information about the contact or account, finding relevant uses cases to reference, or even looking for competitive technology. But let’s put into context what 27% of a seller’s time actually means; that is one week of the month or one quarter of the year. Imagine giving a seller an additional quarter to make their number or week to make their month. That would have impact. Sellers can recover their proficiency by breaking down call prep into three parts – each one minute a piece with the right tools. The key is having the information all in one place and to not over analyze the process. Minute One – The Account. Companies make purchases because they are either dissatisfied with what they currently have or they have a pain they have yet to remedy. Its the seller’s responsibility to understand which one to make the right sales play. First, ascertain if the prospect is using a competitive solution to see if they have already addressed the issue your company can solve. It they have not, look for triggering events to link your solution to solve stated pains or goals. Use the News! Minute Two – The Buyers. CEB has stated that the average B2B purchase has 5.4 decision makers and most sellers are talking to the lowest one on the org chart. Successful sellers uncover the entire buying committee by name and position. Then they have these individuals ready for the reference as individuals to contact for unanswered questions or invites for the next steps of the sales process. By letting the contact know – you know the other players in the process and are going to bring them into the evaluation gives you power later in the sales process. Minute Three – Use Cases. Buyers want to understand how their peers have used your solution to solve similar problems. Having specific use cases available by industry, size, location, competitor, title, and product before the call will show the prospect you are knowledgeable and prepared. It will also show you are a trusted resource and perhaps a notch better than your competition for that reason alone. Most sellers don’t have much of this information available to them, much less so to be able to prepare in three minutes. However, this data is readily available, whether inside or outside of Salesforce.com. Gathering this information and placing it inside of the Account / Lead / Opportunity record is core functionality for RampedUp – but it can also be uncovered in other ways. But then we are back to where we started – 27% of a sellers time is spent looking for this stuff already. Jill Konrath coined the term Use the News – when she unveiled her breakthrough methodology of Trigger Event Selling. The concept is very simple; companies share their achievements / goals in the form of press releases and we as sales people should align our products and services to help reinforce those achievements / goals. If a company takes the time, energy, and effort to create a press release then that company obviously thinks the topic is very important. The opposite is also the case. If a company is receiving bad press then that company wants to be able to tell the media, stock holders, and customers that that company is doing everything within its power to rectify the situation. And more importantly, has the process in place to ensure it won’t happen again. Savvy Sellers combine Trigger Event Selling with Account-Based Selling by looking for these potential selling activities within their targeted accounts. This isn’t a new idea, Google News Alerts can be set up for every targeted account inside of a seller’s territory and has been available for over a decade. The best part about Google News is that it’s free as well. The problem with Google News alerts however is that it sits outside of Salesforce.com, and as my old sales manager told me, “If it’s not in Salesforce.com – it doesn’t count.” Trigger Events need to be inside the Salesforce.com account record available for the entire account team to see. A BDR needs to reference an account using the same trigger on which a sale person is building a business case that will be strategized with a sales manager. Only then can we link Triggering Events to Account-Based Selling successfully. BDR: The BDR notices that the target account is moving away from a hosted AWS solution to an in-house infrastructure. This will open many opportunities for internal hosting. Sales Person: The sales person shares relevant stories about how similar customer moved off of AWS due to recent outages and hacking scares. Sales Manager: The Sales Manager identifies a former satisfied customer that moved to Dropbox in a position to help influence the opportunity.